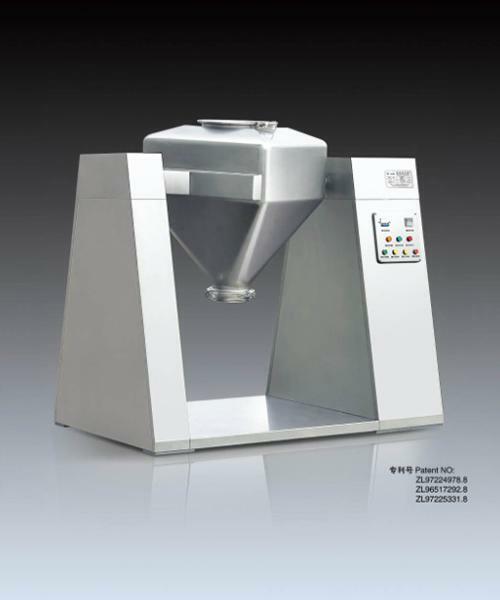 The HF square-taper blender is highly efficient powder raw material and granular material piece of mixing equipment. It is an internationally advanced material mixer used for mixing in medicine (herbal and western alike), chemical mixing (chemical raw materials, coloring matter), light industrial material mixing, and agricultural mixing (seeds, feed additives, other materials). light, and food industries. 1. The entire mixer features a novel, compact structure with a great appearance, and even mixing performance. The mixing evenness reaches 99%, with a volume change coefficient of 0.8. 2. This mixer is equipped with a low rotating height, smooth running, reliable performance, and easy operation. 3. The highly polished inner and outer surfaces of the barrel with no dead corners makes material discharge, and blender cleaning easy with no risk of cross contamination, thus ensuring it is in full compliance with GMP requirements.